With the thesis winding down, and nights opening up I’ve started running a 5e game here in town. So far it’s been fun, and with the tweaks I’m enjoying it. The seed of the campaign comes from the one of the two RuneQuest modules* I own and is very much a sword and sorcery sort of thing. House rule 1: the only playable races are human, dragonborn, and tieflings, and tieflings have to roll for random mutations. Even with the horrible defects this has not dissuaded players from running tieflings. House rule 2: the only playable classes are barbarian, bard, monk, paladin, and warlock. I like this. It makes things weird in a nice way. Barbarians are the weird outlanders. Bards are wanderers and rogues. Monks make for strange mystical opponents. Paladins are like wizard-knights, and warlocks are just weird. Maybe not so surprisingly, everyone has decided to play one of the above except for a paladin, which I’m fine with. House rule 3: slower level progression. 300XP to get to 2nd level? Fugg that noise! * Reading these modules I have to wonder if you needed a PhD in anthropology to play RuneQuest. In Ur, the party hired a cohort of orc magi and assaulted the ghoul stronghold, where they slew plenty, and one or two of them was nearly slain themselves. They encountered one Helemor the Awakened, but were unable to defeat him. He escaped down to the lower level where strange machines emit eerie lights and a column of pitchlike darkness rises to fill the sky above the complex. They’re peering about, regrouping, and preparing to go below. Next, Dennis ran his own megadungeon campaign and I got to play in that. This game is more my speed with roll 4d6 drop lowest and place in order. In that game, I rolled up a halfling named Paisley Frogsbody, and based him on Glum from the old Adventures of Gulliver cartoon. He’s a hoot to play, and his battle cry is: “I foresee the worst!” So far it has served him well. Finally, I’m finishing up my summer classes by playing games. 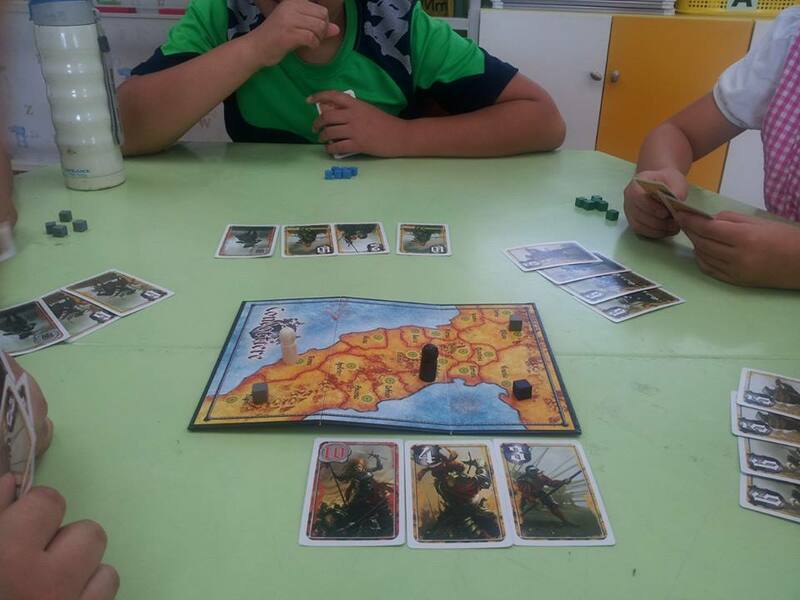 I’ve got one class playing Condottieri, and they seem to enjoy it. They know the game’s set in Italy, but don’t really care about Renaissance history. Mostly I’m using it to teach numbers with the lower-level class. What I really like about that game is how it’s simple to learn, but spirals upward nicely in complexity. My other class I have exploring the Haunted Keep from Moldvay Basic. No, it’s not actual D&D, but a much simplified creation along the lines of a Fighting Fantasy game or something. I just called it The Ghost Fighter Game, and had them each make a Ghost Fighter. We did character gen one day along with drawing the playing pieces, and then started playing on the other. 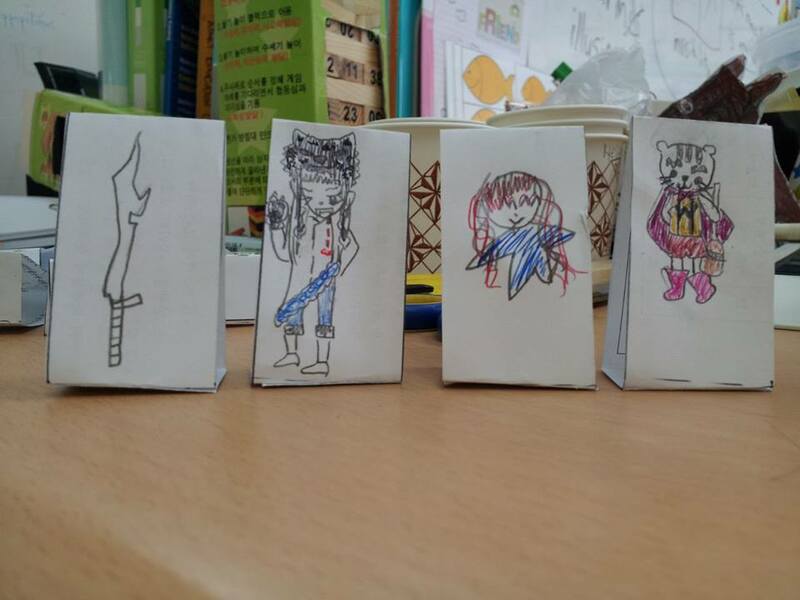 From left to right, it’s Sparta Ghost Sword, Wolf Girl, Super Blue, and Witch Tiger. Meteor Crocodile, the last party member, can be seen in the other picturet behind Wolf Girl and Super Blue on the left. That’s all. Vacation begins in 21 hours. I never really got the hang of adventure design. Some kids I knew made meticulous maps and filled pages with neatly written stat blocks and all that junk. I never quite had the wherewithal to do that, and pretty much did my best getting just winging it (and ripping off the last movie/book/TV show consumed). For awhile this actually worked – but not always. So I did the meticulous design thing, but it wasn’t as fun. 1. 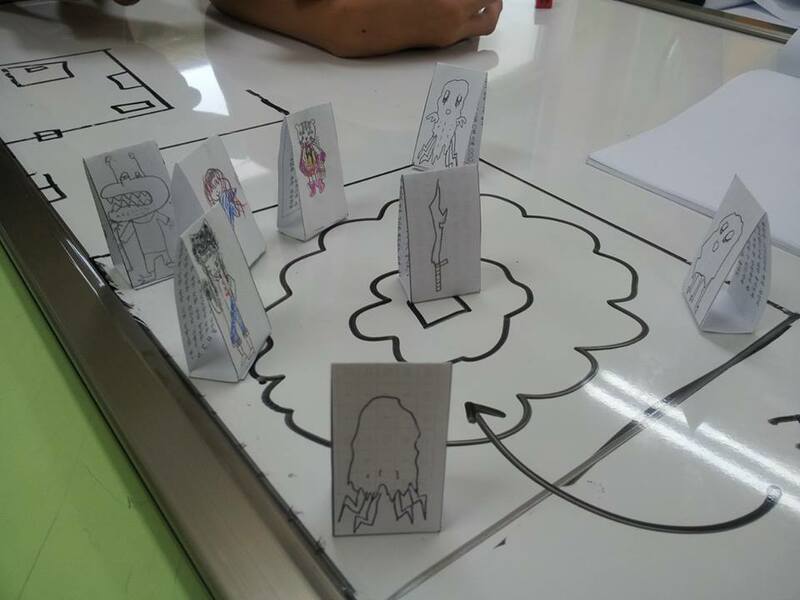 Obstacles: Think of the opponents the characters may encounter. Give them turf and an agenda, and not just dopey room assignments. Have them actively engage with the party. This is basic stuff. Literally. It’s Keep on the Borderlands. 2. Settings: Think of all the things the party might encounter in an area then fill out one of these. Drop some dice. Adventure. These hex drop tables are a lifesaver. A few drops and you pretty much have an adventure. And that’s how it’s done, and generally an hour or two before the game’s scheduled to start. In the years between the eighth and ninth cataclysms the remnant population of Ur came into contact with the Hive. Where the initial matriarchs of the Hive came from is lost to history, but it is speculated that the first matriarch was a renegade from her own civilization who sought shelter in Ur. 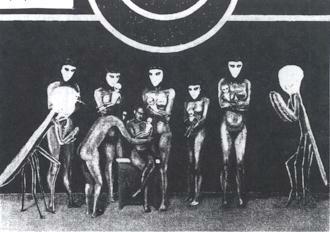 Symbiosis between local humans and the Hive occurred over the next few centuries. Now the towers of the Hive rise above the south east section of Ur. The Hive is a massive structure, riddled with tunnels. Strangers must dose themselves with bug powder in order to communicate with the population. Those under the influence of bug powder have increased sensory perceptions and can interpret the chemical signals the beetle residents use to communicate. 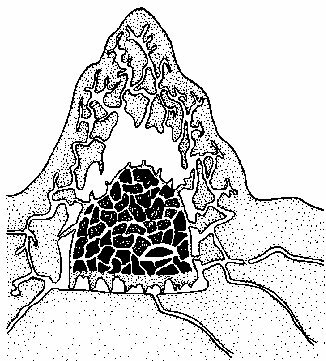 In the center of the Hive is the central air shaft and fungal garden. From here rise ventilation shafts around which the tribes have their quarters. Far above in the towers sit the “great minds” – strange human insect hybrids that have devoted their lives to research and study. While in the depths below are the reservoir royal chamber where the queen spends her days surrounded on all sides by her loyal guard. The humans of the Hive are divided into various tribes kept complacent via chemicals distributed through their bug-regurgitated rations. At times population pressures force struggles between tribes. In combat Hive tribes-people fight as fighters, using weapons and armor fashioned from beetle carapaces along with various chemical concoctions such that burn, confuse, or immobilize. Most groups will be led by a 3rd level fighter and have a cleric in their midst. Unused tunnels run throughout the Hive, and these are often home to outcasts, predators, and other trespassers. Also ruined buildings can be found in places throughout having been absorbed into the Hive over the centuries. But is it really a schedule change if there was never any schedule in the first place, eh? From now on Thursdays* are going to be gamedays around here. I figure it’s about time there’s some consistent content on this blog, and I’ve stolen so much from so many other gaming blogs that posting my own stuff seems only right. Not to mention most of this stuff has already been written in some shape or form even if it’s only scribbly-scrawl at this point. Pretty much all of it will have been used in play and pulled from my Vaults of Ur game. Whether there’s any other content remians to be seen. *Times are listed in Korea Standard Time. My Thursday may in fact be your Wednesday.